He is known for hispower and ability to deflect and defend many high powered people. This is theSword of Ulquiorra Schiffer. Ulquiorra Schiffer has been give a rank of number 4amongst all of the Arrancar and Hallow under Aizens command. This sword has alot of power once wield by Ulquiorra. 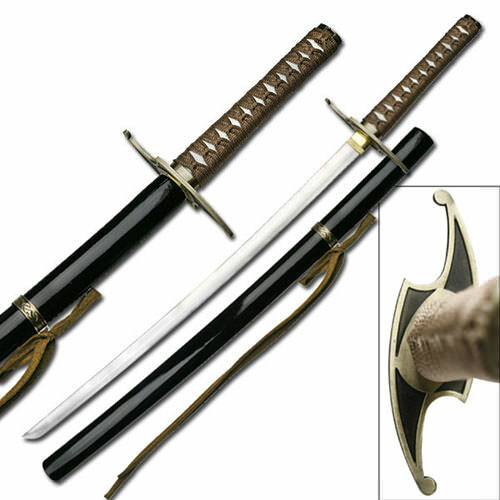 This particular sword has been createdwith the exact image of Ulquiorra Schiffers Sword in the Beach Anime series.The pommel is traditional metal which followed by the brown nylon cord wraphandle, under it has an imitation same. Two bamboo peg is visible which tellsus that its a full tang sword, meaning, the blade and handle all fix in onepiece. The guard has two curved extensions from its long sides, with aline going through both sides to give it an eye-like appearance. The blade ismade from carbon steel and has a satin finish. The saya (scabbard) is 100% woodwith a high gloss black lacquer finish. The saya also has a metal throat with ametal ring at the middle and a matching nylon bow as the same color as thehandle. Around the middle ring has a design with bat. After all his sword Murcielagocan be translated as Bat.